The Certification Program of the American Nurses Credentialing Center (ANCC) provides certification recognized by employers across the United States. Certification is available for 12 different types of nurse practitioners, 10 different types of clinical nurse specialists, and 25 different types of specialties. 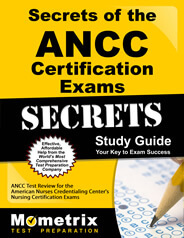 Prepare with our ANCC Certification Study Guide and Practice Questions. Print or eBook. Guaranteed to raise your score. Get started today! The cost to register for the ANCC exams varies on a variety of factors. The basic exam fee for members of the American Nurses Association (ANA) is $270, compared to $395 for non-members. These fees include a non-refundable $140 administrative fee. Those who cancel are eligible to receive some money back, but that depends on a variety of factors and additional fees may also be charged. Those who require special testing accommodations will be accommodated by the ANCC, provided they provide documentation of their disabilities that are defined by the Americans with Disabilities Act (ADA). All ANCC exams are reported on a simple pass or fail basis. The determination as to whether a test taker passes or fails is not dependent upon how other test takers perform. The exams are called “criterion-referenced” tests, which mean that there will be a minimum score required in order to pass. This minimum score represents the very minimal standard that the test taker must meet in order to practice his or her profession safely. All exams are reported on a scale with a maximum possible score of 500. To pass an exam, a scaled score of 350 or higher must be achieved. All exams contain between 150 and 175 questions that are counted towards the final score, and 25 pilot questions that will not count towards the final score. 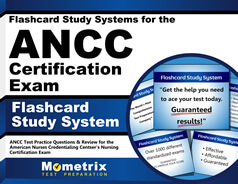 ANCC Certification Flashcards. Proven ANCC Certification test flashcards raise your score on the ANCC Certification test. Guaranteed. There is no penalty for guessing, so test takers are advised to manage their time to ensure every question is answered, although test takers will not be allowed to go back and answer questions they were unsure about. All exams are considered “closed book,” meaning no personal items or devices are allowed during the test. The testing center will provide scratch paper and pencils, which are the only items that are allowed to be used during the exams. Test takers will also be required to sign a confidentiality agreement, meaning test takers are not allowed to publicly release details of any of the questions from the exam. If a test taker fails his or her exam, the score report will include feedback for each of the content areas there were tested as part of the examination. For those who receive feedback, the feedback categories that will be given for each section will be either “low” (score obtained is below the acceptable level), “medium” (score obtained is marginally acceptable), or “high” (score obtained is well above average). There will likely be additional eligibility requirements other than passing the examination that must be met for each different type of nurse. Test takers are strongly advised to review these requirements at the website of the ANCC. Registration for each of the exams is done on the website of the ANCC. Approximately six weeks after completing the application, test takers will receive either an eligibility notice (assuming they are eligible). Once eligibility has been confirmed, the test taker is responsible for scheduling a testing date at one of the Prometric testing centers across the country, which will be done at the Prometric website. Test takers have 90 days to make an appointment, and are advised to schedule a time and location as soon as possible, as waiting until the last minute to schedule can result in a test taker being given a testing time or location not to their liking. Test takers of all ANCC exams will be given the results of their exam on site. If a passing score was achieved, a test taker’s certification start date will be the date the exam was completed. For those who do not pass the ANCC, exams can be retaken after 60 days have passed from the date last tested. No more than three exams are allowed in any 12-month period. Those who must retest will need to resubmit an application and ensure they still meet all eligibility requirements.